When you have a universe as successful as Fable’s, it's inevitable that spin-off titles will eventually emerge. Enter Fable Heroes, a game that takes the series’ enemies and locations and transforms them into a cel-shaded, lighthearted beat-'em-up. The possibilities seem exciting and rich on paper, and yet it’s anything but. Fable Heroes' greatest flaw is that it can't overcome its issues to be anything more than a bland experience. Sometimes a game can be technically sound, and still shoot itself in the foot by failing to offer any semblance of a new or exhilarating journey. And for all the creativity we've seen spread throughout the Fable series, this is probably what's most disappointing about Fable Heroes. A button masher at heart, there’s almost no story in Fable Heroes. You'll choose a puppet from a selection of about a dozen, each with some different attacks, but nothing truly unique. With the aid of three AI or human partners, you'll bash enemies using either light or heavy attacks, along with a special super attack that, if used, sacrifices some of your health. It's simplistic and easy to pick up and play, but the downside is that it's too shallow. Unlike, say, Castle Crashers, with its varied combos and situational attacks, Fable Heroes offers little additional depth beyond button mashing. The main attraction in Fable Heroes is collecting as many coins as possible, since loot is not only used to purchase new power-ups and puppets, but also determines the winner of each level. The loot aspect is actually the area in which this game becomes competitive, since another player can steal the hard-earned loot that enemies drop. Unfortunately, the level design is lacking. Sure, you're venturing into many noteworthy Fable lands, but all the levels come off as redundant and bland because they all play out exactly the same: kill lots of enemies, smash a large, unmoving object in Break Time for mad cash, and then face a mini-game or boss to end the level. To be fair, Fable Heroes does attempt to infuse choice into each level by offering "Good" and "Evil" treasure chests. If you open a good chest, a randomly selected player will receive a bonus; choosing evil grants the opposite -- a player at random will suffer. 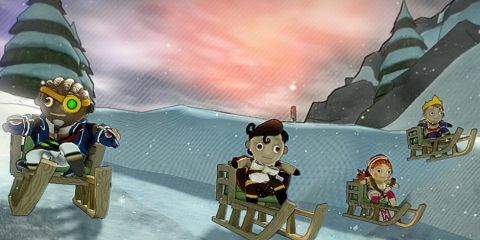 At level completion, there is a choice about where to venture next, determining if the level ends with a boss battle or mini-game. In addition, once you complete a level, you'll roll dice on a small game board; depending on what space you land on, you'll be able to purchase new abilities and power-ups. It's frustrating when you're looking to unlock a specific ability or power-up, because it’s never guaranteed that you'll land on the space. Fable Heroes simply feels uninspired, making it difficult to generate much enthusiasm to continue playing it. Its dull environments, repetitious level design, and shallow gameplay provide a lackluster experience. Not to mention, you can play through to the credits in about two hours. Seeing the credits grants you access to dark mode, a gameplay twist in which levels are supposedly tougher and, unsurprisingly, darker. Honestly, the game is just spitting the same levels out, and the challenge is quite overstated. Lionhead’s attempt to create a quirky multiplayer experience through Fable Heroes results in a game that attempts to please everyone, and instead, falls flat. Despite its familiar setting and cute puppets, it’s tedious and boring, and misfires on multiple fronts. When a game fails to take risks and carve out its own identity, it undoubtedly shows. Fable Heroes aspires to get your bucks, but it’s a game with very little “bang” going for it. Description Lionheads attempt to create a quirky multiplayer experience through Fable Heroes results in a game that attempts to please everyone, and instead, falls flat.